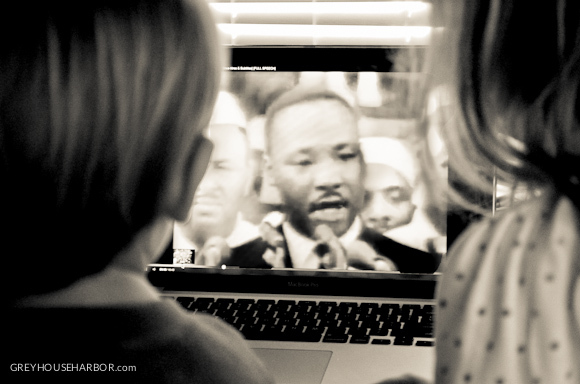 It’s an honor and great responsibility of parenthood; to introduce your children to historical people and events. When I told Songbird that she didn’t have school today she quickly asked why. This of course led to a discussion about who Martin Luther King Jr. was and why we celebrate his life. I intentionally did not say “black” or “white” but rather talked about darker and lighter skin. Songbird was confused at the thought that people with different shades of skin couldn’t use the same bathroom or sit in certain bus seats. There is nothing that brings history more to life than teaching it to a small child for the first time. I, for one, can’t recall a time when I didn’t know about MLK and often take his contributions for granted. But watching his famous “I have a dream…” speech, I found myself misty-eyed and wishing he had lived to see how far our country has come. Often when I talk to Songbird about history or life lessons, I’ll ask her later in the day what she remembers or learned about it – just to see what stuck. A sweet, simple 5-year-old summation.